Who are they? 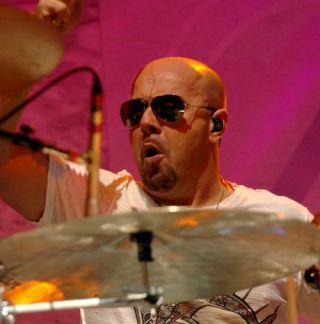 Jason Bonham links up with blues axe-master Joe Bonamassa, classic rock journeyman Derek Sherinian and former Deep Purple siren Glenn Hughes. Sounds like: A bunch of classic rock superstars plonked in a rehearsal room. Which is pretty much exactly what they are actually. Why should you check them out? Black Country Communion are one of those bands that you have to hear, if only to see if it all lives up to the hype. It's also great to hear Jason Bonham back behind the kit, even if the band's debut album is a little overblown at times. There are definite moments when it all clicks into place though, with the groove and hook of 'Sista Jane' a case in point as it delivers a swaggering mix of Bonamassa's blues background and the sizable classic rock CVs of messers Bonham, Sherinian and Hughes. On record they fail to quite live up to the recent crop of classic rock supergroups, but Black Country Communion remain a band that are sure to be one hell of a spectacle when they hit the road. The album is due to drop in September and we're hoping for some UK dates before the end of the year. Now that would be one hot ticket.